When Walsall arrive at Fratton Park this evening, there will be a familiar face in the visitors’ ranks. Connor Ronan looks set to be included in Dean Keates’ match-day squad to face Pompey – which will mark the first time he comes up against his former club following his summer departure. The 20-year-old spent the second half of last season on loan at the Blues from Wolves. He moved to PO4 alongside fellow Molineux youngster Sylvain Deslandes in January to bolster Kenny Jackett’s side’s League One play-off push. There was plenty of excitement when the Republic of Ireland under-21 international arrived, after departing the west midlands with rave reviews. Ronan was held in high regard by the Wolves faithful and considered a potential future first-team regular. He had already made seven appearances for Nuno Espírito Santo’s outfit during their early push for the Championship title. Following an impressive display during his side’s Carabao Cup shootout defeat to Manchester City, he was cherry-picked by Kevin De Bruyne to swap shirts. That anecdote, particularly, had Pompey fans purring. Blues supporters had hoped Ronan could remedy the problem number-10 position the likes of Kal Naismith, Kyle Bennett and Conor Chaplin had all unsuccessfully auditioned for. Judging by his performance on his League One debut, it certainly looked like Ronan was the answer to Jackett’s prayers. 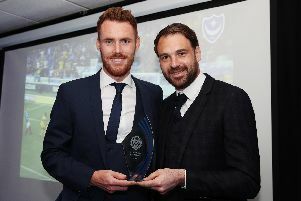 He delivered a swashbuckling first-half display during Pompey’s 2-2 draw with top-six rivals Scunthorpe, whetting the Fratton faithful’s appetite for the remainder of the campaign. But, overall, his spell on the south coast was underwhelming. There were few times in his subsequent 15 appearances (only seven of which were starts) when Ronan matched the heights he showed against the Iron. He returned to Molineux without scoring and just a solitary assist to his name. On the whole, he struggled to meet the physical demands of League One. Nevertheless, Ronan will return to his ex-club with a point to prove as Walsall look to put the skids on Pompey’s League One title charge. He’s only started one of the Saddlers’ past four League One outings, but he’ll likely have the bit between his teeth if he does feature at Fratton Park. Although he wasn’t at his zenith during his loan spell at the Blues, the forward has the quality to hurt Jackett’s side. The youngster demonstrated his potential on occasions last term, weaving his way past opposition defences before picking out a sublime pass to swiftly get a move going. The Rochdale-born ace also frequently impressed his team-mates on the training ground and they’ll certainly not be taking him lightly.